I love to knit children's socks,baby socks,but my gray area is grown up socks. I have this book...New,never used and I would like to give it away! It could be yours...with some other goodies. And for a short time will email you a Pdf if you leave me a comment with your e-mail. Best wishes for a Happy Holiday Season to all. Your grays are so beautiful, and the circles have created something stunning. Would love the instructions for your huswife! Something to look forward to after the holiday rush! Happy Christmas to you! I love the Thermus and your choice of buttons! I'm with you on the socks. I love baby socks, but the adult ones... not so much... I think it's so great that you wrote up the pattern for the huswife. I'm not a sew-er, but I think I would like a copy if you don't mind... Who knows... maybe someday... If not, then I still have the beautiful one you made! Sheila...and anyone without a blog link...PM me your email of you want the file/pattern. Blogger does not give up your info! Hi u, I love your greys, they are so classy. I absolutely love that bracelet - that is gorgeous. I wish you all the best for this holiday season...see you on the other side. I love grays, your Thermis us gorgeous!! Definitely something snugly to wear in this snowy weather. What a great gift ~ a real treat for some lucky person! I wish I was progressing. I wish I was confident. Beautiful post . No need to enter me. You have blessed me enough. Would love the PDF for your huswife. I haven't knit baby socks yet, just adult. I have to say that I have finally hit on toe up, two at a time magic loop method and have conquered single sock syndrome. (It was however pointed out to me that I could have cast on both socks on two sets of needles all along and thereby fixed that problem...) oh well. The greys are lovely. the greys are beautiful, and I have been envious of your huswife for some while. Best of the season. I am in the mood for greys too. There is something about greys and winter that is soothing. No need to enter me as lucky enough to have one from you. p.s. I put up some pics on my blog. Have happy holidays! I, too, love gray. In fact, several walls in our house are painted a dark gray. So soothing, yet also neutral. They go with all my fave earthy colours. I would be delighted to be the recipient (if chosen) of the wonderful sock book. I'd also really appreciate the pattern for the huswife -- you're so multi-talented! The black buttons are a fab choice! thanks in advance for sharing your directions for the huswife! found your hand work at zebra knits. lovely, simply lovely. Please send along that great pattern - yours is lovely! (foppersATcharterDOTnet) That book is on my wish list too! Your thermis will be gorgeous - more fabulous button magic! I've been admiring your huswifes and wish I had one one, but this could be even better. Thank you for writing up the pattern and a bigger thank you for offering to send it! You will share?! I would love to make a huswife after the holiday rush - some quiet hand sewing sounds lovely. Thank you, how generous of you. By the way, all the grays are beautiful, they lend a quiet cocoon, so cozy. Beautiful post. Everything looks lovely. 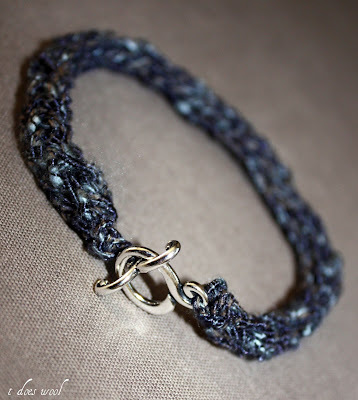 The bracelet is fantastic in the Berroco Seduce. I'd love the instructions for the huswife. I think it would be the perfect January project. Thank you! 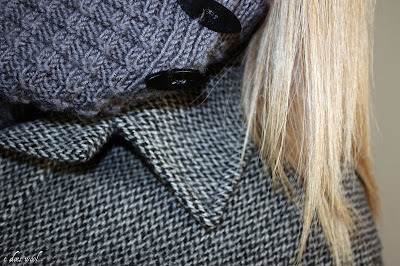 The greys look so very cosy - ready to cocoon with in on these dark midwinter evenings. Hand sewing a huswife might just be the thing to cocoon with in january after the holiday excitement. I would appreciate a copy of the pattern to work from. Happy Holidays. I really love the bracelet...keep up the good work!! Oh, thank you so much! I have adored them since I first saw them on your blog!!! I'm more of a sewer than a knitter & would love to make me a little hswf. Thanks for sharing. The poetry makes for nice atmosphere, on this wintry solstice eve. Be cozy. I ooohed and awwwed over your works of art in shades of gray.....then I smiled as the opening words of your entry took me back many years ago....the monkees. You made my day! Where can we find the bracelet's pattern? It's a funny idea for a gift. All the greys are so pretty. I love the bracelet. So many great shades of gray, and the poem is beautiful! My sewingmachine and me are not good pals, but inbetween we try to communicate - I would love it if I can have the pattern for the huswife, thank you! E-mail is toneabatgmaildotcom. You don't knit grown up socks? That you have to owercome! There are so many beautiful socks just waiting to be knitted, well you have a book full of the beautiful patterns so you probably know. Try one more before you give the book away, please.. I Merry Christmas T, hope it will be a some great days for you and your family! Love your grays, all of them. Thank you for sharing the great shots. I would like to have the huswife pdf. You can reach me at guitnerATcomcastDOTnet. Merry Christmas to you. Merry Christmas, thanks for a beautiful post. PS. I'd love that Pdf too! de-lurking here ! Lov eyour blog - esp the pics ! Would love the pattern to the needleroll ! I do a lot of embrodiery so this would fit me perfectly ! Thank you and Merry Xmas ! Your generous spirit never ceases to amaze me, as well as your beautiful knitting! There are some lucky people on your Christmas list! T - you really know how to make 'gray' SHINE!!!! Love it all!!! just LOVE THEM!!!! I LUV that bracelet.. I have it queued as well. and really need to find the 'right' yarn. It would be such a great gift for my daughter. You are so generous - to share the huswife pattern. I would love, love a copy. Thank you so much. Please enter me in to the draw for the book too. I am just getting in to sock knitting, so I just know it would be very useful. merry christmas! that barcelet is beautiful! i love it. love all the gray too! Love the giveaway....thank you so much. Merry Christmas! Your photos are gorgeous, and I'd love a chance to win a copy of that book! Loving the greys! I think you're inspiring me for a color jag of my own. 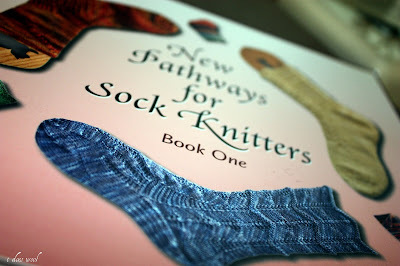 I love to knit adult socks and have had that particular book on my wishlist. I would love to have it. Thanks! Grays usually bore me. But not today. As usual, I love all of your creations. Merry Christmas! I remember singing the "Shades of Gray" song many, many years ago. (Maybe 40 years.) It was on one of my Monkees albums and I knew all the words to all their songs. If it played today I think I could still sing along. "When the world and I were young, just yesterday. Life was such a simple game, a child could play...." Thanks for the memory and Merry Christmas. As usual, you are pure inspiration. 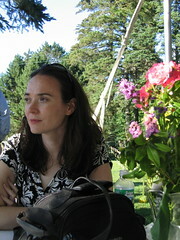 An artist who lives by her Emerson quote. Thank you again for the huswife pattern. Merriest of Christmases to you and yours. I've just found you and discovered your beautiful work. Your grays are divine - your choice of yarn and patterns delicious... am looking forward to 'visiting' you for a while - am sure my mind will be swimming with inspiration over the holiday break, thanks to you. Stunning greys in the bracelet, mmmm. Thanks for sharing the pattern. May your holidays be anything but grey, enjoy! I would like to recived your pattern and to enter in the giveaway, I am trying to get back to knit and quit my addition to sew. I would like to go back to my origins, and that book would be the perfect excuse! I stumbled across a huswife you'd made for someone as a gift and then here. I love the texture and the practicality. A pattern you say? Wonderful! Am so desperate to make a huswife (have tried, and failed, not half such an object of desire as yours...sigh) Would be very grateful to you for a pattern to make my very own, especially after finding the tinyiest, cutest scissors...) Please..? Pretty please..? I'd love a copy of your huswife pattern. I love your blog. 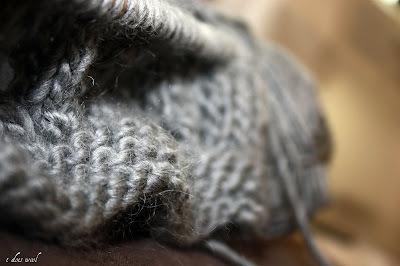 I found your blog through Black Dog Knits, and I absolutely love it! Reposted because it helps to include an address, right? Am I too late? I would very much like to have a go at making the huswife, if you're still willing to send out the pdf. I think they have similar ones in the Museum for Personal Adornment in Manchester – beautiful, faded and much used ones. Hello, bonjour... Another French passing by. I saw a huswife over at zebraknits and I clicker through to read more about them; I would love the pattern too, if you still send it out. If not I shall improvise..
T, I love following your creative process - the knitting the sewing, the beautiful photographs!! I'm inspired and would love to gift huswife myself, if the pattern is still available would you please send me a copy.